A major typhoon is sweeping through Japan. For three days, torrential downpours and black clouds heave covered our valley. There have been moments of sunny skies to break the gloom. Two nights ago, I became convinced I would be struck by lightening. The clouds were thick and heavy. I could barely see the streetlight right in front of my window. Thunder and lightning shook the house every two minutes. About every ten minutes, I heard the big crackling an death rattling lightning strike. We are surrounded by forest on the backside. It sounded like the trees were getting pounded. Every time he lightning flashed, our whole room lit up. I found myself wanting to crawl into my mom’s bed, until I realized I AM the mom know. Amazingly, my three-year-old never woke up. My baby woke once but was easily calmed by my presence and fell back asleep. Clearly, he couldn’t see the panic on my face in the dark. During the day, I drive slower than the numerous grandmas here. I am very cautious of rain on windy mountain roads. When the rain pours the hardest, I stop in to the nearest eatery and pig out until the weather calms down. It is for the safety of my children. A bonus is the delight of my tummy and meeting new faces. Along the back country road, there is a little development. The drive surrounds me in forestry, rolling hills,and vistas of the town and farms below. Rarely, I stumble upon a little eatery. My first thought is where do they get customers? The road feels deserted, as if I am traveling through a fantasy world by myself. I am frequently the only customer at places I stop. I enjoy the intimacy. The shop owners have time to talk with me, whether out of boredom or any real interest in me. They are always surprised to see a foreigner, especially with a baby in tow. Today, the rain suddenly picked up speed close to home. I pulled into a little cafe run by a local farm. The little house is surrounded by apple trees and blueberry bushes. The windows look out over the uninhabited forest and a lonely log cabin with wild flowers. The kitchen is run by a mother and daughter team while the grandfather comes in and out as he tends the farm. It feels like dining in there home, as multi generations gather in the kitchen for a family meal while I eat next to them in the dining room. The entryway is filled with bags, dolls, tissue holders, and other items hand sewn by the grandmother. It feels more homey than my own home. My baby crawls around and takes in all the attention. Meanwhile, the daughter serves me hot tea. 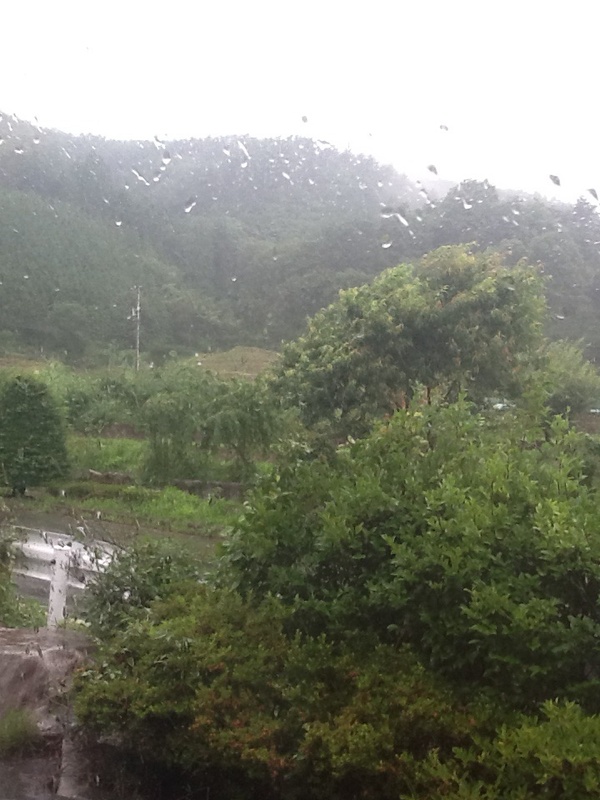 While I relax and watch the downpour, I see her dash out into the typhoon rains to a shed. She comes back in, drenched, holding a small bowl. 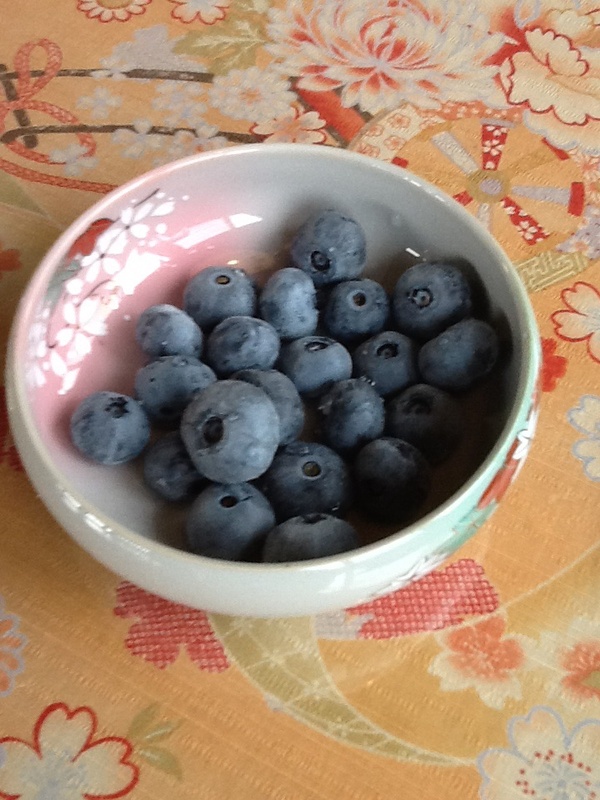 Would you like some blueberries while I cook? Would I ever! I feel guilty that she suffered the rain for me to eat blueberries and savor them even more than usual. The baby ate them right up! He will be quite disappointed when we get back to eating produce in the desert. The restaurant only serves three dishes. One is soba (see my noodle post: https://misomommy.wordpress.com/2014/07/02/noodles-a-japanese-noodle-guide/). 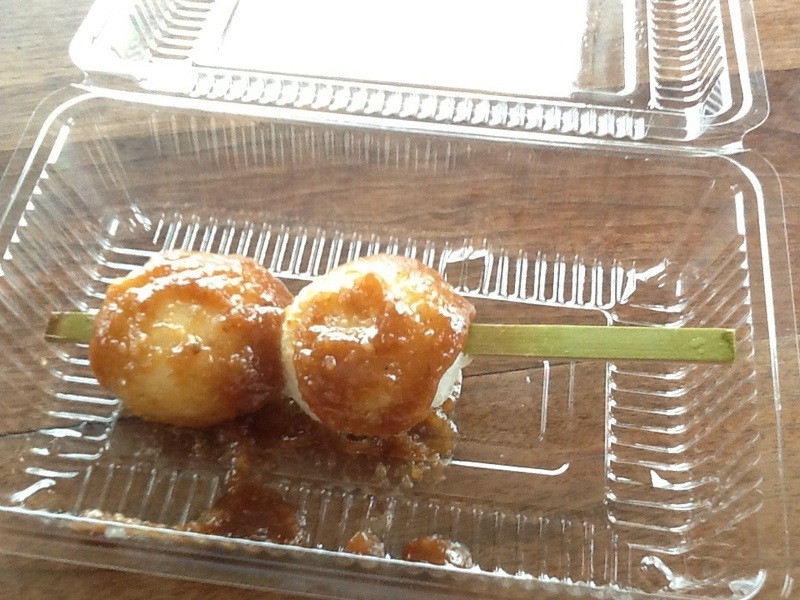 Another dish, displayed proudly on a outdoor banner, is grilled rice balls on skewers slathered with a sweet and chunky miso paste. The third dish is called kurumi. I ordered it blindly and then learned about the dish as it arrived. 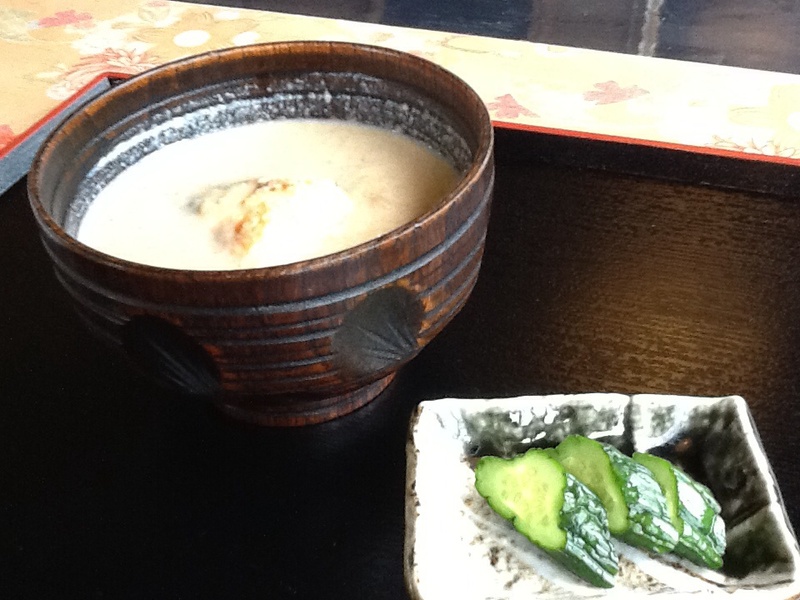 Kurumi looks like white miso soup, but it is actually coarsely ground walnuts boiled in a sweet broth. 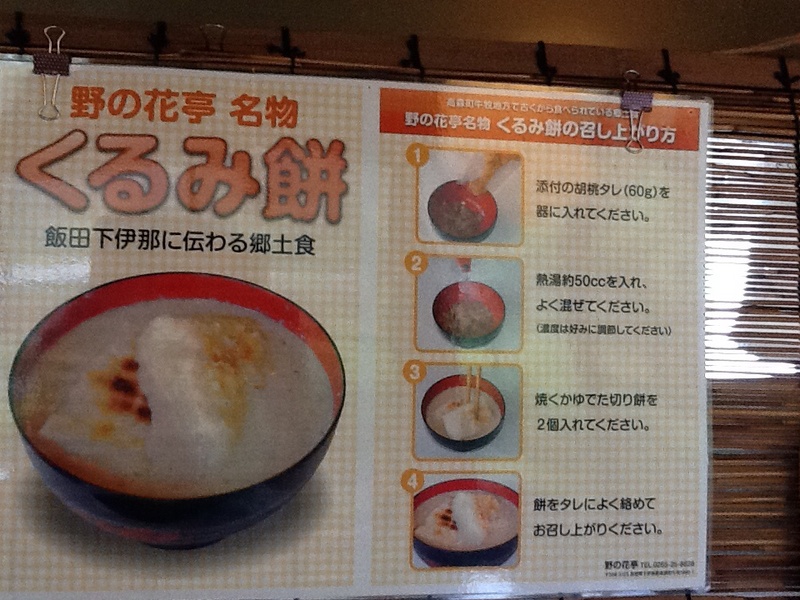 The soup is topped with two, freshly-grilled mochi squares. The aroma of buttery walnuts and grilled rice filled the air. As I dug in, the mochi softly pulled and stretched. I bit off a piece at a time, chewed the mochi, and drank the soup. In between bites, I looked over the storm and the mountains. As you can seem the soup came with homemade pickles. The salt content is lower than commercial pickles and the experience is crisp, cool, and refreshing. I didn’t think it could get any better, until she brought out local cherries that she had frozen. They were like little cherry Popsicles plucked right from the cherry tree. 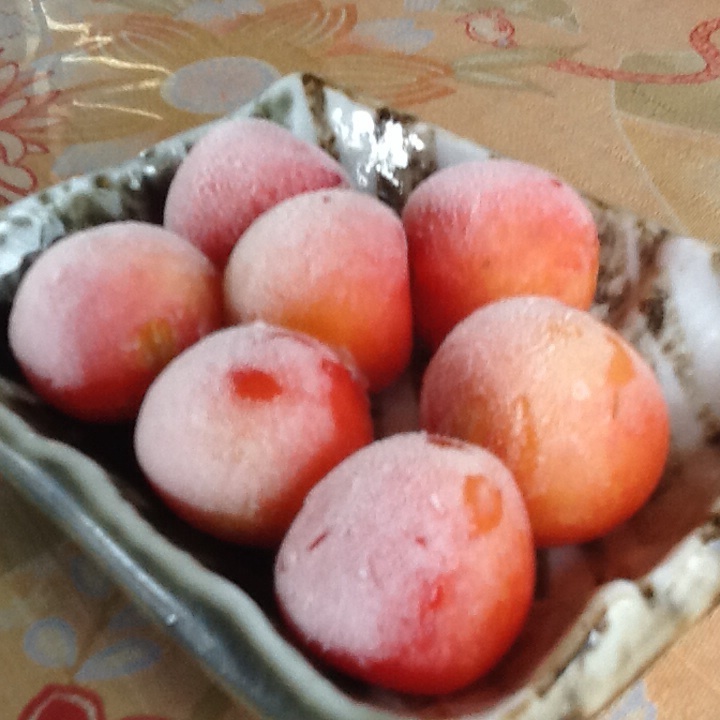 Frozen cherries – a refreshing summer treat! After a delicious respite, it was time to face the tsunami and drive slowly home. Life in the heart of Japanese farmland is a big change from the glitz and modern conveniences of Vegas. The lack of distractions here is refreshing. When I ride around town, I see vistas of emerald mountains, rice patties, apple trees, and traditional homes constructed of weathered wood. This is in stark contrast to the desert landscape of warm hues, endless rocks, and 24hour gaming joints with glittery lights. We start our days with homemade breakfasts made from produce and dairy from neighboring farms. 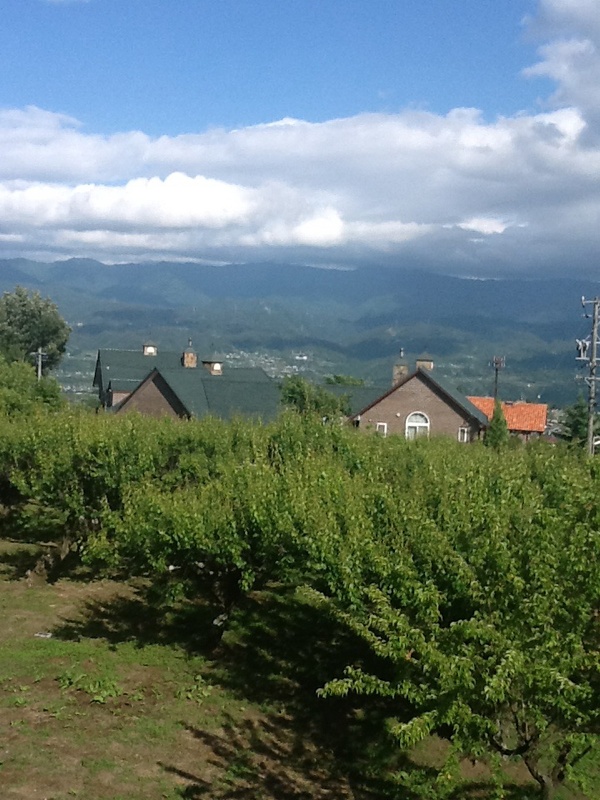 We eat overlooking a plum tree orchard and huge vista of the Japanese Alps. In a country packed full of people, it is a real treat to live with a view of uninhabited mountain tops. Today’s breakfast included sushi-grade salmon I pan-seared with soy sauce, local rice, and old-fashioned watermelon with seeds. Modified produce, like “seedless” watermelon is not prevalent in Japan and produce really tastes different and better. Tomatoes and cucumbers actually have flavor! After breakfast,we journey through winding country roads to a small city center in the neighboring town and drop Nico off at school. I am still obsessed with the adorable outfits and bowing three year olds! When we walk into the school, Nico must change from his outdoor sneakers to special indoor shoes. As we changes, a group if his classmates greet us in dress-up clothes, smiling, bowing, and shouting out “ohayo gozaimasu” (good morning). While Nico plays at school, the baby and I head to a local bakery. 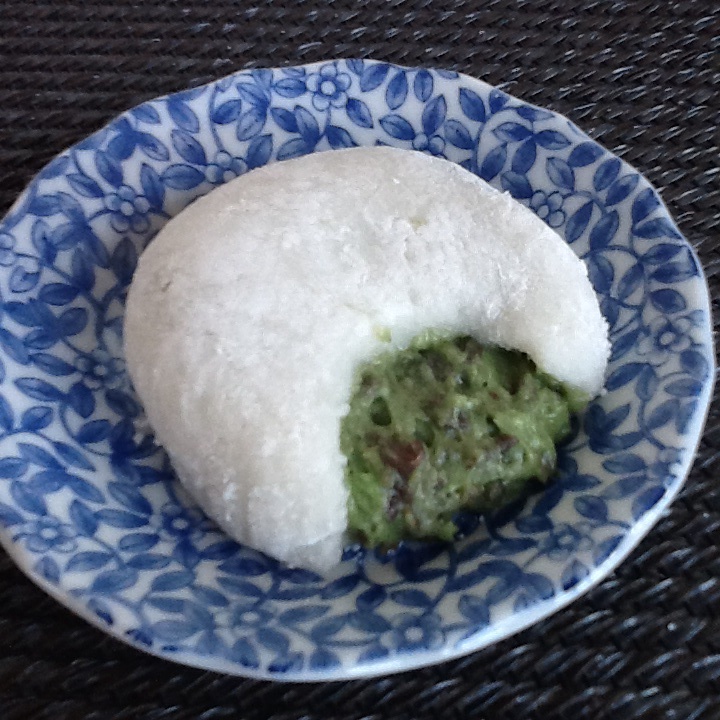 I indulge in this white mochi (smooth, sweet sticky rice). Soft as a marshmallow, I bite into and discover a green tea whip cream with mashed up azuki, sweet red beans frequently used in Japanese sweets. So umami! So delicious! I wish I could leave samples on the blog!